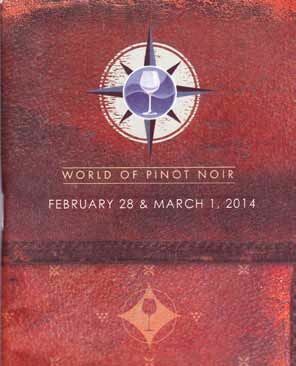 On February 27, 2014, I hit the Pinot Trail to attend four major events in California. Like the song, “Sugartime,” from the 1950s sung by the McGuire Sisters, it was “Sugar (Pinot) in the morning, Sugar (Pinot) in the evening, Sugar (Pinot) at suppertime. Be my little sugar, And love me (Pinot) all the time.” The trail first led me to Santa Barbara for the 14th Annual World of Pinot Noir, then to San Francisco for three more memorable events: a special retrospective tasting of the wines of Ted Lemon titled “30 Years of Winemaking, 20 years of Littorai,” at Jardiniere restaurant on March 2, Affairs of the Vine Pinot Noir Summit at The Golden Gate Club on March 9, and the In Pursuit of Balance seminars and tasting at Bluxome Street Winery on March 10. The World of Pinot Noir successfully relocated this year from its long-standing home in Shell Beach to the Bacara Resort & Spa in Santa Barbara. The switch was an easy choice because of the many participating wineries in the Sta. Rita Hills, Santa Maria Valley and the city of Santa Barbara. This was an impressive upgrade in venue that was thoroughly welcomed by all attendees despite the onslaught of rain throughout the weekend. Gone were the crowded tents at The Cliffs Resort in Shell Beach, replaced by a magnificent ballroom that not only provided plenty of space to comfortably visit and chat with the many producers, but lent an air of hi-collared ambiance that was more fitting for the regal majesty of Pinot Noir. For me, this was the BEST World of Pinot Noir experience ever! 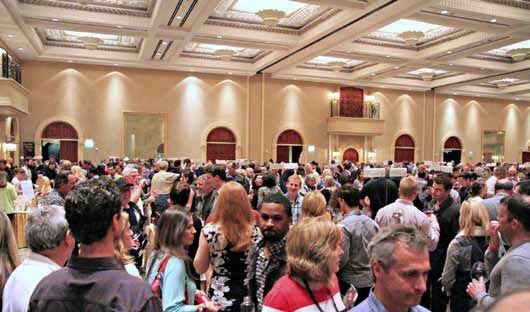 Each year I attend the World of Pinot Noir where over 225 wineries from around the world participate and offer wines to attendees at seminars, dinners and walk-around tastings, and I return with renewed admiration for the dedication of those who craft these marvelous wines. As always, winemakers, winegrowers and winery owners were in abundance and eager to talk Pinot. 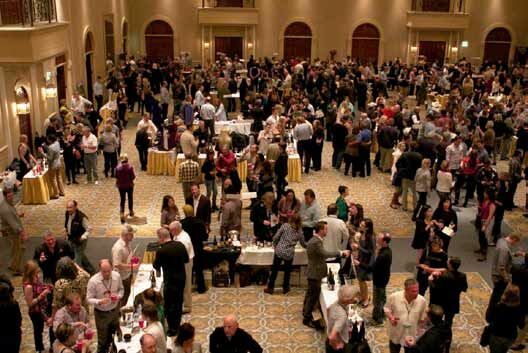 The World of Pinot Noir is a convivial festival that unites the international community, launches and renews friendships, and allows all present to revel in their good fortune. 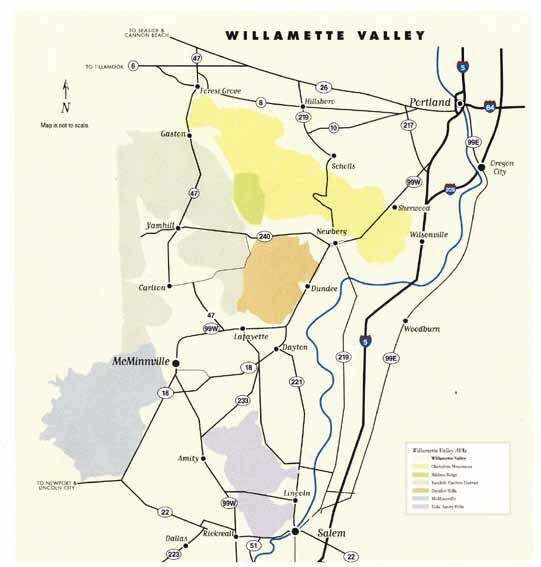 Oregon’s Willamette Valley is located between the Cascade and Coast ranges. More than 100 miles long and 60 miles at its widest point, the region has infrequent freezes and wide diurnal shifts (summer average high is 78ºF and low 52ºF). Acres of vines by variety: Pinot Noir, 11,053, Pinot Gris 2,175, Chardonnay 684, and Riesling 259. 88 percent of Oregon Pinot Noir comes from the Willamette Valley. Vintage notes: 2011 had a late start and was the coldest growing season in 50+ years but a warm, sunny and dry autumn made a November harvest a success resulting in a classic, cool-climate vintage; 2012 had some hail damage but overall was a warm growing season making for rich, full-bodied and approachable wines that will undoubtedly receive high scores. In this seminar, each of the six sub-appellations of the Williamette Valley were discussed and two wines from each sub-AVA were offered by a representative producer. 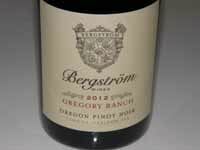 I sensed that many of the attendees were unfamiliar with Oregon Pinot Noir and were quite impressed by the wines. Chehalem Mountains - Colene Clemens This is the largest of the six sub-AVAs of the Willamette Valley. It is characterized by the highest elevations and diverse soils including uplifted sedimentary seabeds, basaltic lava flows and Laurelwood loess (wind-blown silt). The ridge is up to 1,600 feet elevation with most vineyards located 300 to 800 feet elevation on both the south and north slope of the ridge. Chehalem Mountains has 100 vineyards, 1,600+ acres of vines, and 31+ wineries. Colene Clemens is located in the northwestern part of the AVA across the street from the Ribbon Ridge sub- AVA at 325 to 650 feet elevation. The soils are primarily sedimentary but with substantial basalt (volcanic) rock. The wines tend to show more of the red spectrum of fruits and are more delicately structured than the wines from Ribbon Ridge, representing somewhat of a middle ground between the wines from the volcanic soils of the Dundee Hills and Eola-Amity Hills and the wines from the sedimentary soils of Yamhill-Carlton and Ribbon Ridge. A total of 40 acres of Pinot Noir were planted (Pommard, Wädenswil, 115, 667 and 777) between 2006 and 2010. The Victoria Cuvée is the winery’s top offering each year, named after Colene Clemens’ daughter. 50% Pommard and 50% clone 777, aged 11.5 months in 40% new French oak. The wine will easily last 10 years. 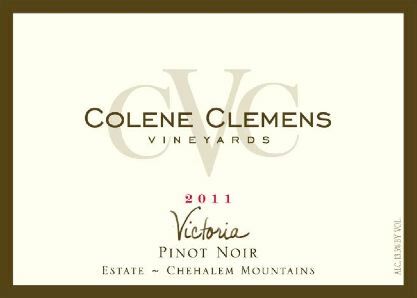 2011 Colene Clemens Victoria Cuvée Chehalem Mountains Pinot Noir 13.5% alc., 294 cases, $58. Released fall 2013. 100% de-stemmed, aged 11 months in 42% new French oak barrels. Unfined and unfiltered. Aromas of black cherries, rose petals, and toasty oak. The broad flavors mimic the aromas with balanced tannins, generous acidity and a long finish. Outstanding. 2012 Colene Clemens Victoria Cuvée Chehalem Mountains Pinot Noir 14.5% alc.. More body and density than the 2011 vintage, with copious amounts of black cherry fruit accented by spice, citrus and tea. Nicely integrated tannins and a big, fruit-driven finish. Will benefit from more time in the bottle. Outstanding. Ribbon Ridge is the smallest sub-AVA in the Willamette Valley. It is a 3-mile-long, 1! mile-wide ridge with mostly Willakenzie (sedimentary) soils with some Dupree silt loam. The sub-AVA has 27 vineyards, 500 acres of vineyards, and 10 wineries. 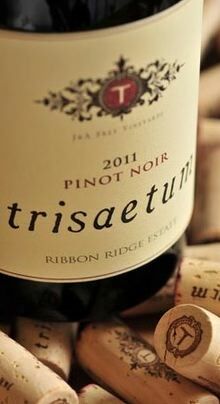 2011 Trisaetum Single Vineyard Ribbon Ridge Estate Pinot Noir 12.8% alc., $55. This wine features dark cherry and cassis aromas with more red fruits showing up on the palate. The very chewy tannins will need time to resolve. Great acidity. Very good. 2012 Trisaetum Single Vineyard Ribbon Ridge Estate Pinot Noir 14.4% alc.. Similar to the 2011 vintage with darker berries on the nose and palate showing more depth and very broad tannins. Needs a few years in bottle. Very good. Dundee Hills was the first sub-AVA planted in the Willamette Valley (1965). It is located in the heart of the Willamette Valley with predominantly Jory (volcanic, clay, red) over sedimentary sandstone soils starting at 350 feet elevation. The area is protected from weather by the coastal mountains and is something of a banana belt. Grapes are generally earlier maturing and harvested first. There are 50 vineyards, and 1,700+ acres of vines and 37+ wineries. 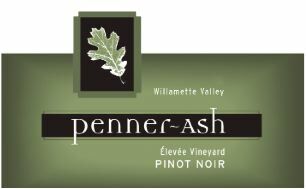 Note: Penner-Ash Wine Cellars is located in the Yamhill-Carlton AVA but sources grapes from the Dundee Hills. The Pinot Noirs from the Dundee Hills feature red fruits such as strawberry and it said you can almost taste the red soil in the wines. Lynn has worked with grapes from almost every sub-AVA, but has a long history with fruit from the Dundee Hills, beginning with her years of making wine at Rex Hill Winery beginning in 1988. Both wines offered have a base of clone 777 but have Pommard (Èlléve Vineyard) or 115 (Bella Vida Vineyard) added to provide structure that 777 lacks. 2012 Penner-Ash Èlléve Vineyard Dundee Hills Pinot Noir This wine features sweet, red berry fruits with hints of dried tea leaves and spice. The acidity is bright and refreshing. Very good. 2012 Penner-Ash Bella Vida Vineyard Dundee Hills Pinot Noir The darker fruits are lush and mouth filling backed by mature tannins. Rich and long with layers of flavor. Still a bit tight and in need of cellaring. Outstanding. 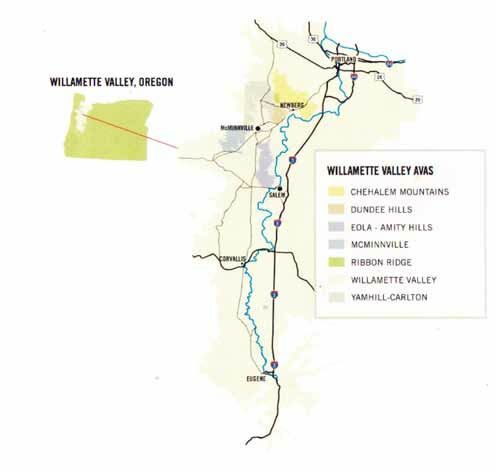 Some of the oldest marine sedimentary (Willakenzie) soils in the Willamette Valley are found in the Yamhill- Carlton District. The region’s elevation varies from 200 to 1,000 feet and sits in the Coastal Range shadow. There are 45 vineyards, 1,200+ acres of vines, and 41 wineries. In general, the AVA features darker fruits depending on the vintage with broad, supple and silky tannins, exotic spices including clove and cardamom in warm vintages and minerality. The Estate Bayless-Bower Vineyard lies on property owned by the Bayless family since 1906. 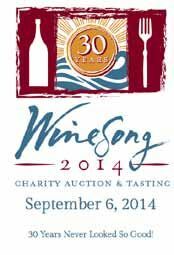 It sits across the street from Ken Wright’s Abbey-Claim Vineyard and adjacent Tony Soter’s Mineral Springs Ranch. Rebecca said that Soter was attracted to this area because the wines offered “more than simple fruitiness.” The Bayless-Bower Vineyard is planted to 5 clones: Pommard, Wädenswil, 114, 115 and 777. 2011 Ghost Hill Cellars Yamhill-Carlton Willamette Valley Pinot Noir More austerity in this vintage but appealing red fruits, spice, rose petal and earth notes. Very good. 2012 Ghost Hill Cellars Yamhill-Carlton Willamette Valley Pinot Noir More sweet, rich fruitiness with a note of sassafras and spice. Outstanding. The coastal influence in the McMinnville sub-AVA makes for drier, windier conditions. Typically, the soils are shallow sedimentary and volcanic over basalt. There are 10+ vineyards, 600 acres of vineyards, and 10 wineries. The Pinot Noirs from McMinnville have a very high concentration of phenolics as well as high acidity and will age extremely well. Robert Brittan hales from the Napa Valley where he made Cabernet Sauvignon for many years in the Stag’s Leap District. He has found it considerably more challenging vinifying Pinot Noir in Oregon. He chose his 128- acre site in McMinnville because it was challenging and had the potential for producing distinctive wines. Brittan replanted vineyards on the property and added vines and now has 25 acres planted to Pinot Noir, Chardonnay and Rhone varieties. The vineyard is on the northern edge of the Van Duzer Corridor so although it is fairly windy, it is less windy and rainy than the Eola-Amity Hills and is drier and cooler than McMinnville in general. There are 5 to 6 soil types on the property with variable soil depth. A Balsalt Block Pinot Noir is sourced from parts of the vineyard with the largest concentration of sub-marine basalt and a Gestalt Block Pinot Noir from originates from primarily shallower soils. 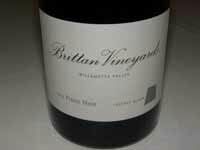 2011 Brittan Vineyards Basalt Block Willamette Valley Pinot Noir From a cool vintage with a long maturation period. Bright red and black fruits with fine tannins. Very bright and juicy. Outstanding. 2012 Brittan Vineyards Basalt Block Willamette Valley Pinot Noir A warmer, shorter vintage with no rainfall during the summer. Less fruitier and more earthy, yet possessing richness. Outstanding. The Eola-Amity Hills sub-AVA is located in the Van Duzer Corridor so it receives cooling ocean winds, (it is said to be “windy as hell.”). There are many soil types but predominantly Nekia (shallow, volcanic) and Jory. There are 52 vineyards, 1,300+ acres of vineyards, and 27 wineries. Rajat Parr has only been involved with Evening Land Vineyards for only 3 weeks so his remarks were brief. Evening Land wines are crafted by Isabelle Meuniere with consulting winemaker from Burgundy, Dominque Lafon. The wines are from the Seven Springs Vineyard, an east-facing site with Nekia volcanic soils at 300 to 600 feet elevation. Nekia soils are shallower than the volcanic Jory soils in the Dundee Hills. The 120-acre vineyard was first planted in the 1980s, and is located on the east side of the sub-AVA which is less cool and windy than the west side. Although Parr has been a proponent of whole cluster inclusion in fermentation, Lafon is not a fan of stems so there are no stems in the two wines presented at the seminar. 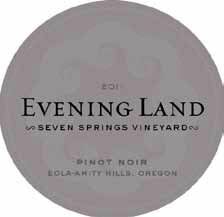 2011 Evening Land Vineyards Seven Springs Estate Eola-Amity Hills Pinot Noir A blend of the entire vineyard picked at 19º-20º Brix in mid-October. No tasting notes. 2009 Evening Land Vineyards La Source Seven Springs Estate Eola-Amity Hills Pinot Noir Picked 5 weeks earlier than the 2011 wines at 25º-26º Brix. Sourced from the heart of the vineyard and aged in 20% new French oak. No tasting notes. Featured Burgundy Producer Frédéric Barnier Mason Louis Jadot. Maison Louis Jadot was founded in 1859 when Louis Henry Denis Jadot set up as a merchant. Vineyard purchases started with Beaune Clos des Ursules which is featured in the tasting here. 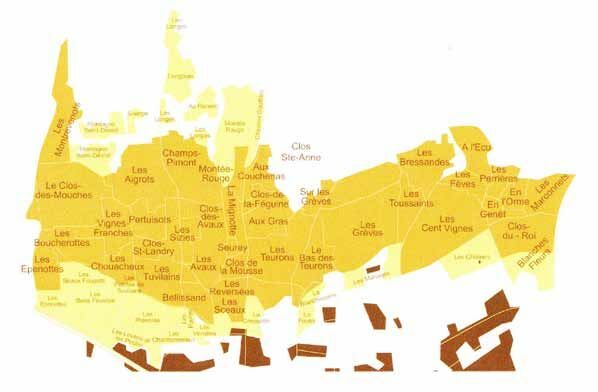 The area covered by the Beaune appellation is vast and complex. The northernmost point is marked by the Maconnets and the southernmost point by Les Boucherottes (see map). There are over 400 hectares of planted vineyards, of which 337 hectares are first growths. There are no Grand Cru vineyards but 36 Premier Crus. Red wines account for 90% of total annual production. Beaune’s terroirs are based on sedimentary bedrock laid down on the floor of a great ocean during the Mesozoic era (Jurassic period some 150 to 160 million years ago), and more recent strata formed during the Quaternary period (the last great ice age). The southern part, where the Clos des Ursules is located, is a watershed zone with numerous alluvial fans (loam soils with layers of clay on the surface). The vineyards are on steep slopes of up to 20% to the North and gentler slopes to the South. Most of the vineyards face east-southeast. The red wines from the central and southern parts are powerful, tannic and deeply colored while those from the northern area are generally less intensely colored with softer fruit flavors. The Clos des Ursules is a walled portion of the Beaune 1er Cru Vignes Franches, an area whose vineyards were exempt from taxes during the middle ages. It owes its name to the religious order of Saint Ursula which was created in France in 1586. The nuns of this order arrived in Beaune in 1626 and based themselves in the building that is now the town hall. The order acquired the Clos in 1676 when it was designated as follows: ‘A walled vineyard within the boundaries of Beaune.’ Louis Henry Jadot bought the vineyard in 1826 and it has been owned continuously since by the Jadot family. The most recent plantings date to the mid-1970s, but more than half the vines were planted during the 1950s. With a total area of little more than 2 hectares, this Clos produces structured wines which are firm and rich. The aromas are complex and slightly earthy and the finish long and lush. Tannins are firm. These wines age extremely well over the course of 10 to 15 years with proper cellar conditions. Fermentation is carried out naturally in open tanks without stems. The wine usually undergoes a fairly long fermentation of 25 to 33 days to extract color, tannins and aromas. The different lots are vinified separately and then aged in oak barrels for 15 to 18 months. Blending is performed at the end of vinification. My general impressions of the wines were as follows. All wines had notable acidity and firm, prominent tannins. The red fruit was delicate in comparison to the tannins and acidity, with both of the latter standing out. Some wines had green notes. The 1985, 2005 and 2010 wines had the best balance. The Clos des Ursules wines are definitely food wines and not terribly appealing on their own in lesser vintages, at least at a relatively young age. The 1985 vintage wine, now nearly 30 years old, revealed the marvelous ability of these wines to age, and showed that these wines need time. 1985 Louis Jadot Beaune Clos des Ursules A very charming, well-preserved wine with moderately deep color, aromas and flavors of earthy cherry, brown spice and mocha. 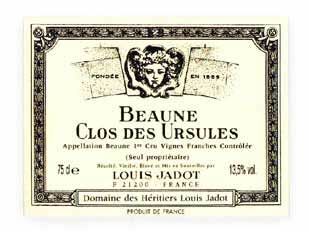 1990 Louis Jadot Beaune Clos des Ursules Slightly vegetal in a good way with a long, lush finish showing a hint of baking spices. 1997 Louis Jadot Beaune Clos des Ursules A rugged wine with dominant tannins, very delicate red cherry and berry fruits, and an underlying green streak. 2003 Louis Jadot Beaune Clos des Ursules Very dusty and rustic with secondary characters of old book, caramel and chocolate truffle. Plenty of tannin. Seems to have aged faster than other wines. 2005 Louis Jadot Beaune Clos des Ursules An impressive wine with good richness of black cherry fruit. The fruits are riper and darker in this vintage with noticeable mid palate fullness and length. The firm tannic backbone is well proportioned. 2008 Louis Jadot Beaune Clos des Ursules Similar in flavor profile to the 2005 vintage but leaner with more tannin and prominent citrus-driven acidity. 2009 Louis Jadot Beaune Clos des Ursules Lean and green, reserved and tight, with muscular tannins overwhelming the submerged fruit. Needs time. 2010 Louis Jadot Beaune Clos des Ursules Remarkably forward with a plethora of pretty cherry fruit underlain with spice. Very fresh with balanced tannins, bright acidity, and remarkable length on the generous finish. A Maison Louis Jadot Burgundy Dinner was held Saturday night, March 1, in the Miro Restaurant Wine Cellar at Bacara Resort. I did not attend this seminar but it was recorded for later posting on Grape Radio (www.graperadio.com) and the World of Pinot Noir website (www.wopn.com). This was a 3-hour presentation focusing on the “insider wines” of the Cote d’Or. The insider wines are often sought out by knowledgeable Burgundy enthusiasts who enjoy their value and pleasure, while the more expensive, high-profile wines are saved for special occasions. In addition, there was a detailed discussion of the mountain of Corton, location of the Cote d’Or’s greatest expanse of Grand Cru vineyard acreage. Eric Anderson and I recorded a conversation with Donald about his career and his personal insight into Burgundy. This will also appear on Grape Radio and the World of Pinot Noir website. This was a highly entertaining seminar that was very informative, yet filled with laughs because the panel was very animated and unpretentious. Both Proctor and McClintic appeared in the documentary film ‘Somm,’ and they spoke about their experience. Burroughs was in the popular film ‘Sideways,’ and Ostini owns the restaurant that was a central focus of the film and where several scenes were shot. 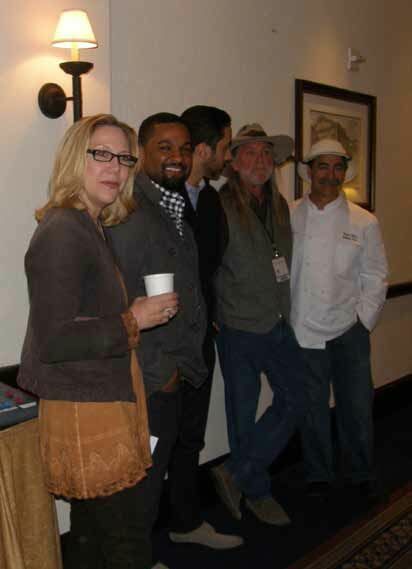 They provided considerable insight into the making of the film and the impact it had on Santa Barbara County wineries. Sara Schneider did a marvelous job harnessing the lively panel. 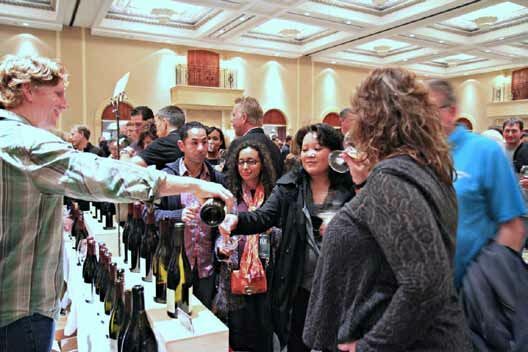 The walk-around Grand Tastings at the World of Pinot Noir, like similar tastings at other events, are not a venue for serious, extensive wine tasting. 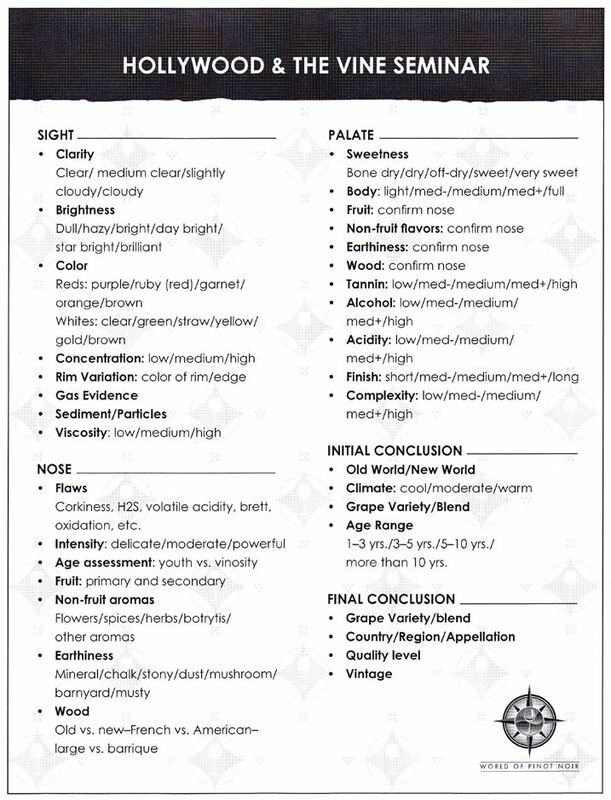 Admittedly, the best way to critically evaluate or even thoroughly enjoy Pinot Noir is to taste it over time. As wine writer Eric Asimov said several years ago, “Part of what makes Pinot Noir so exciting is it’s elusive nature. From one moment to the next, the aromas and flavors of a good Pinot Noir change in the glass, making it difficult to pin down.” Not infrequently at these tastings, the host pops the cork on a bottle in front of you and pours you an ounce or so without giving any time for the wine to open up. That said, evaluating wines in this setting is an acquired skill that enables the experienced taster to develop lasting impressions gained by brief flings with a wine. It has been said that Pinot Noir is like love, when the right one comes along, you know it. 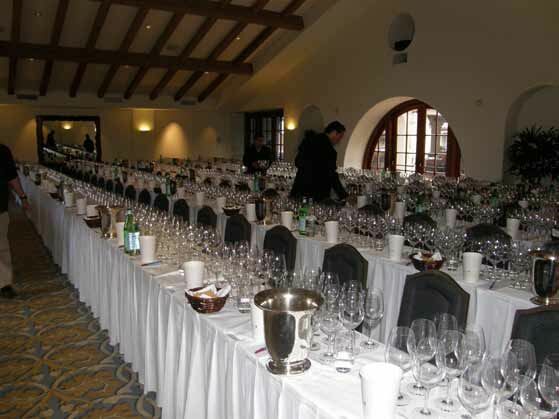 The photos below will give you a feel for the Grand Tastings held in the large ballroom at the Bacara Resort. You can sense the buzz in the room. Clearly, I could not taste every wine or even all the offerings of every producer. There were, however, select wines that grabbed my attention and I have listed them here and in some cases provided brief comments. These are wines that are worth further exploration. Do not stress if you cannot find a particular wine, and do not feel that my choices are sacred cows. I have learned at these events by asking others what their favorite wines were, that more often than not their choices do not match all the wines that I preferred. In spite of the potential differences in palate preference, I do recommend paying attention to the producer’s name. Many of the wines tasted are from the glorious 2012 vintage and not released yet. I did not taste wines from wineries that I review regularly in the PinotFile. 2012 Alma Rosa La Encantada Sta. Rita Hills Pinot Noir Dependable Richard Sanford tirelessly promotes his wines and region, and never seems to lack for enthusiasm at the many events at which he pours his wines. He has put his financial setbacks behind him, and continues to eagerly offer a range of top flight wines at sensible prices. He knows this vineyard intimately as he originally planted it. Still very young, but offering an appealing floral nose and a luscious core of earth-kissed red fruits backed by bright acidity. A quintessential Sta. Rita Hills Pinot Noir. 2012 Babcock Winery Slice of Heaven Sta. Rita Hills Pinot Noir From Block 14 at Rita’s Crown Vineyard. The lengthy story of “Slice of Heaven” is detailed by Brian Babcock on the winery’s website. A cherry bombast with plenty of likable cherry aroma and flavor with a substantial finish of uncommon length. 2012 BARDEN Sta. 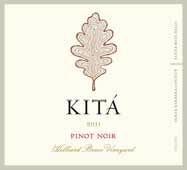 Rita Hills Pinot Noir 14.3% alc., pH 3.66, TA 0.60, 178 cases, $82. My first experience with this wine from Margerum Wine Company vinified by winemakers Jason Barrette and Doug Margerum. 30% whole cluster, natural fermentation, aged in 50% new French oak barrels for 9 months, bottled unfined and unfiltered. Beautifully balanced with a tasty core of middleweight cherry fruit. 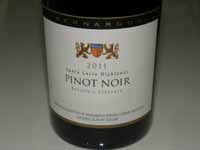 2011 Bernardus Pinot Noirs This excellent wines are detailed in a feature elsewhere in this issue. 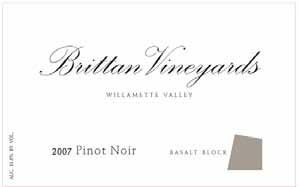 2011 Brittan Vineyards Basalt Block McMinnville Willamette Valley Pinot Noir Sourced from parts of vineyard that have the heaviest concentration of sub-marine basalt resulting in low yielding vines that produce intense flavors. Impressive fruit intensity and vividness with a balanced, firm tannic backbone, and a long, pleasing finish with a spark of citrus. 2011 Brittan Vineyards Gestalt Block McMinnville Willamette Valley Pinot Noir Sourced from the west-facing and most exposed blocks in the vineyard, resulting in a wine that is transparent to its vintage. A little darker in color than the Basalt, offering luscious plum and blackberry fruits, substantial tannins, and a lip smacking, acid-driven finish. Charlie Heintz produces less than 1,000 cases of Pinot Noir Rosé, Chardonnay, Pinot Noir and Syrah from Heintz Ranch under the Heintz and Dutch Bill Creek labels. The winemaker is veteran Hugh Chapelle. I spent quite a while talking with Charlie who is extremely passionate about his vineyard and wines. I have always relished Chardonnays from Heintz Vineyard but the Pinot Noir was a surprise and the Syrah was one of the most memorable wines I tasted at World of Pinot Noir. 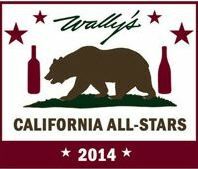 Most of Charlie’s fruit is sold to name California producers including Ceritas Wines, DuMOL, DeLoach Vineyards, Flowers Winery, Freeman Vineyards & Winery, Littorai, Moone Tsai, Peay Vineyards, Peirson Meyer Wines, Williams Selyem, and Zepaltas Wines. 2012 Charles Heintz Vineyards Heintz Vineyard Sonoma Coast Chardonnay 143 cases, $45. Aromas of lemon curd, roasted nuts, and citrus lead to a full-flavored core of rich citrus fruits and chalky minerality. 2012 Charles Heintz Vineyards Heintz Vineyard Sonoma Coast Syrah 200 cases, $46. I wasn’t going to taste this wine as I rarely drink Syrah, but Charlie insisted and was I glad. This is cool-climate Syrah at its best. 2 acres of Syrah grown with very low yields. 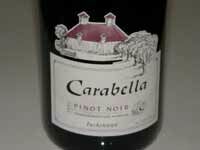 Drinks like a Pinot Noir, with a silky texture and impeccable balance. Enticing flavors of red stone and berry fruits with hints of spice and oak. A flat-out gorgeous wine. 2012 Cirq Estate Treehouse Sonoma Coast Pinot Noir Winemaker Michael Browne’s own label made from his own vineyard farmed by partner Charlie Chenoweth. California’s next cult Pinot Noir. Despite being bottled only two weeks prior, this wine was very forward and giving. Velvety soft tannins caressed the intense core of plum, blackberry and black raspberry fruits. My notes say, “Drinking great.” Allocated. 2012 Couloir Wines Sebastiano Vineyard Sta. Rita Hills Pinot Noir 33% whole cluster fermentation. The bright acidity of the Sta. Rita Hills is on full display bringing the layers of red and black fruits to life. Beautifully crafted with impeccable balance and a finish that is reluctant to go away. 2012 Couloir Wines Chileno Valley Vineyard Marin County Pinot Noir 13.8% alc., TA 0.68, 193 cases, $44. 25% whole cluster. Aged in about 15% new French oak barrels, unfined and unfiltered. Relatively light in color, but packs a wallop of well-spiced red fruits. A very generous wine that ranks among the best I have ever tasted from this small appellation. Love this! 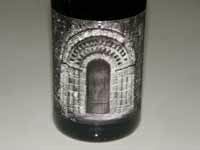 2012 Couloir Wines Monument Tree Anderson Valley Pinot Noir 14.2% alc., TA 0.50, 197 cases, $46. Clones 777, 667 and 115, 50% whole cluster, aged 11 months in 35% new French oak barrels. A lovely, but powerfully flavored wine with plenty of well-ripened red cherries and berries with a hint of spice and oak. 2012 Couloir Wines Campbell Ranch Sonoma Coast Pinot Noir This wine has the typical whole cluster floral display on the nose which I find extremely enticing. Modest in weight, but tasty, with an array of berry fruits backed by sinewy tannins. Still young, but provocative. 2011 Domaine Carneros La Terre Promise Carneros Pinot Noir 14.5% alc., pH 3.57, TA 0.68. Translated as “The Promised Land,” this bottling features Dijon 667 from La Terre Promise Vineyard. Some of the grapes from this vineyard go into Domaine Carneros sparkling wines as well. Very soft and smooth on the palate with a hardy core of sappy fruit, backed by complimentary oak. The tannins are quite suave and the wine is thoroughly satisfying. 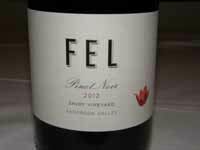 2012 FEL Savoy Vineyard Anderson Valley Pinot Noir 14.6% alc., $50. A new label established in March 2014 by Lede Family Wines in Napa Valley who purchased the Savoy Vineyard. FEL represents Florence Elsie Lede. The winemaker is Ryan Hodgins. The winery also offers a special selection of four barrels of Savoy Vineyard labeled Breggo Spiritus. Glorious aromas of black cherry pie glaze, spice, earth and oak come together beautifully. The mid weight earth-kissed dark cherry core is delicious and carries its intensity through a long finish. Very silky in the mouth, with soft tannins and easy drink ability. One of the top Pinots I tasted at the World of Pinot Noir. Allocated. 2012 Gary Farrell Hallberg Vineyard Russian River Valley Pinot Noir Theresa Heredia has now settled in as winemaker and has put her stamp on the wines. They feature the Gary Farrell style with a little more structure and aromatic charm. This wine features the luscious fruit this vineyard is known for especially in this glorious vintage accented with an array of exotic spices. Great. 2012 Gary Farrell Bien Nacido Vineyard Santa Maria Valley Pinot Noir A typical Bien Nacido offering with aromas of violets and herbs, earthy red and black fruits, and an uplifting finish showing a touch of dried herbs. 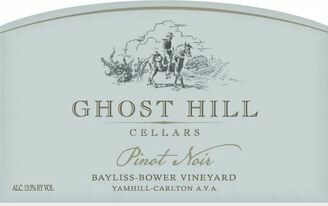 2010 Ghost Hill Cellars Prospector’s Selection Bayless-Bower Vineyard Yamhill-Carlton Willamette Valley Pinot Noir A bright wine with appealing red cherry and blueberry fruits with seamless balance and a refreshingly crisp finish. Just now flashing its best stuff. 2010 Gundlach Bundschu Winery Heritage Selection Carneros Pinot Noir $55. The winery’s 153-year-old estate 320-acre vineyard, Rhinefarm, is located at the southernmost point in Sonoma Valley. This limited bottling is made from some of the oldest vines on the property dating to 1934. This was a surprise for me as I had never sampled this Heritage Selection bottling and found it to be a very special wine. Highly aromatic with scents of black cherries, black plum sauce and floral attaché. Intensely flavored and very complex, yet polished and refined with soft tannins and an amazingly long finish displaying copious black cherry goodness accented with oak. Allocated. 2011 Gypsy Canyon Trois Sta. Rita Hills Pinot Noir No tasting room, a smart beautiful woman on stunning acreage doing what makes her happy. Deborah Hall pretty much single handedly tamed the large property into a haven of grapes, rescued dogs and fulfilled dreams. Consistently one of my favorite wines from this AVA, this three vineyard blend is a special selection of barrels. Each wine is presented in special hand-blown glass bottles. A very feminine, elegant wine with fresh aromas and flavors of red cherries and baking spice. Reflective of the vintage in its delicacy, but highly satisfying. Wait List. 2011 Hartford Family Winery Velvet Sisters Anderson Valley Pinot Noir 14.6% alc., pH 3.81, TA 0.52, $65. The “Velvet Sisters” are local Anderson Valley historical figures who in the language of Boontling lore became known for wearing plush velvet dresses that they had bought on a trip to British Columbia. Sourced from a block within the Falk Vineyard planted to Pommard, 115, 667 and 777. Aged 14 months in 50% new French oak barrels. All the 2011 Hartford Family Pinot Noirs poured at the event were quite special but this one really stood out for me. Very bright and vivid fruit extract featuring aromas and sappy flavors of black cherries, boysenberries, and baking spice. Concentrated, yet refined and silky. Gorgeous. 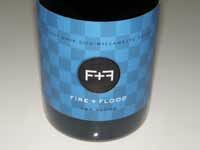 2011 Hartford Family Winery Hailey’s Block Arrendell Vineyard Green Valley of Russian River Valley Pinot Noir 14.9% alc., pH 3.57, TA 0.60, 270 cases, $65. This block, named after Don and Jennifer Hartford’s daughter, Hailey, was planted in 1996 to Dijon 114 and 777 when Hailey was 6 years old. Unfined and unfiltered. Hi-tone aromas of red plum and raspberry echoed on the palate with added nuances of spice. The electric backbone of acidity charges the wine with energy and leads to a mouth watering finish. 2011 Hartford Family Winery Arrendell Vineyard Green Valley of Russian River Valley Pinot Noir 14.5% alc., pH 3.36, TA 0.67, 235 cases, $90. This vineyard is located in the coldest spot in the Green Valley sub-appellation of the Russian River Valley AVA. First planted in 1975, it struggles to ripen one ton per acre of heirloom selections of Pinot Noir. The high natural acidity creates the potential for extended aging. Enticing aromas of black cherry pie glaze, red raspberry jam and dried herbs. Crisp on the palate with a bright cut of acidity, bringing to life the core of cherry, blueberry and raspberry fruits. The finish is juicy and long. 2012 Masút Block 6 Estate 115 Mendocino County Pinot Noir Brothers Ben and Jake Fetzer are the owners, growers and winemakers. 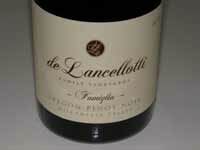 They work with several clones of Pinot Noir planted on 35 acres in Mendocino County’s coastal mountains. Nicely perfumed with aromas of black cherries and black plums with hints of spice. Dreamy softness on the palate with flavors of black cherry, black raspberry and cola with a subtle note of supportive oak in the background. 2011 Masút Estate Vineyard Mendocino County Pinot Noir 14.3% alc., $40. Aged 11 months in 35% new French oak barrels. Highly aromatic with scents of black raspberry preserves, black cherries and toasty brioche. The flavors echo the aromas with an underlying touch of spice and earth. Mild tannins make for easy drinking now and the finish is quite generous and memorable. 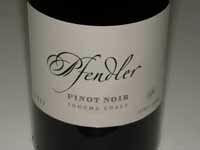 2012 Pfendler Sonoma Coast Pinot Noir and 2012 Pfendler Sonoma Coast Chardonnay - see feature in this issue. Both are extraordinary wines and the best ever from this producer. 2012 R² Wine Company S&B Sanford & Benedict Sta. Rita Hills Pinot Noir 150 cases, $56. 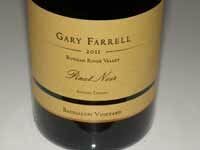 One of the limited quantity Pinot Noirs from the team that formerly owned Roessler Vineyards. Winemaker is Drew Huffine. A beautiful wine with highly expressive dark red fruits on the nose and palate, filling the mouth with pleasure, and exiting with a persistent, earth-toned, fruit-driven finish. Impeccable balance. 2012 R² Wine Company 3-3-3 Sonoma Coast Pinot Noir 150 cases, $50. A blend of the three best barrels of the vintage. Aged in 60% new French oak barrels. A gorgeous wine that exudes charm and elegance, featuring bright cherry, strawberry and cola aromas and flavors. Harmonious with a generous finish. 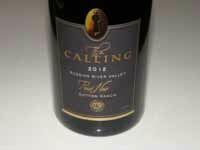 2012 Reuling Vineyard Sonoma Coast Pinot Noir 1,000 cases, $70. This vineyard was planted in 2000 and comprises 12.2 acres of Pinot Noir (Calera and two Burgundian suitcase selections) and 2.2 acres of Chardonnay selections from Montrachet Vineyard. After selling fruit to Aubert and Peter Michael for ten years, owners Tim and Jackie Reuling decided to produce their own wines with winemaker Matt Taylor. 25% whole cluster. Lovely aromas of cherries, spice and subtle oak. Mid weight flavors of black cherry with a savory, spicy undertone and bright supporting acidity. 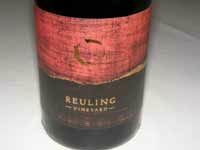 2012 Reuling Vineyard Sonoma Coast Chardonnay 14.0% alc., pH 3.46, TA 0.56, 350 cases, $70. Pressed whole cluster to barrel, barrel fermented, 100% native yeasts, aged 10 months in 50% new and 50% used French oak barrels. This wine really caught my attention with its aromas of lemon, peach and petrichor (dirt after rain). The creamy palate featured white stone fruits, lemon curd, and crème brûlée supported by lively acidity. The finish is long and refreshing. An extraordinary offering. 2009 Sonoma Coast Vineyards Balistreri Family Vineyard Sonoma Coast Pinot Noir 14.4% alc., 50 cases (re-release), $75. Vinified by winemaker Anthony Austin. Harvest ended at the start of November ahead of the rains. 25% whole cluster. Extended 10-day cold soak, spontaneous wild fermentation. Drinking now in its prime with rich black cherry and black raspberry fruit complimented by earthy flora notes and spice. Seamless, with a bombastic finish. 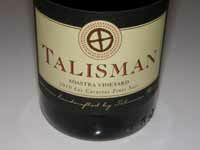 2010 Talisman Wines Adastra Vineyard Los Carneros Pinot Noir 243 cases, $56. 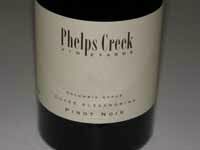 Pinotcentric winery with exquisite Pinot Noirs crafted by Scott Rich. 113, 2A and Pommard. Darkly colored and dark fruit driven with aromas and flavors of blackberries, boysenberries and subtle oak. Very sleek and soothing on the palate, finishing with a burst of fruit. Has some bottle age and drinking beautifully now. Check out feature with review of all 2010 releases in this issue. 2011 Trombetta Family Wines Gap’s Crown Vineyard Sonoma Coast Pinot Noir 14.2% alc., 530 cases, $58. Mother and daughter duo Rickey Trombetta Stancliff and Erica Stancliff share a passion for fine Pinot Noir. This wine is crafted by Erica and consulting winemaker Paul Hobbs. Clones 777, Swan and “828.” Harvest Brix 25º. Native fermentations, aged 9 months in 50% new French oak barrels. Effusive aromas of mixed berry preserves with hints of earth and mocha. Bright and lively on the palate with a broad array of berry fruits accented by spice and vanilla. An elegant, polished wine of great charm. 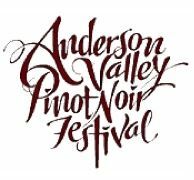 2012 Twomey Monument Tree Vineyard Anderson Valley Pinot Noir A new release and the first Twomey Pinot Noir with the Monument Tree Vineyard designation. A seamless wine in the Twomey style with juicy acidity charging the discreetly concentrated dark red cherry and berry fruit. Hedonistic flavor, yet refined in character. Highly enjoyable. Wayfarer Pinot Noir was the most exciting find at this year’s World of Pinot Noir. This new label from Jayson and Cleo Pahlmeyer features estate grown Wayfarer Vineyard Sonoma Coast Pinot Noir and Chardonnay. 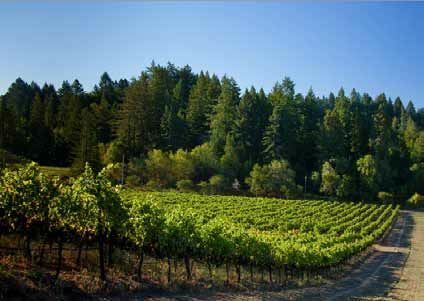 The Wayfarer Vineyard is 30 acres of Goldridge soil hidden among the redwoods two coastal ridges from the Pacific Ocean. Formerly a family owned organic farm known as ‘Wayfarer,’ and just down the mountain road from Marcassin Vineyard in the Fort Ross-Seaview AVA, Helen Turley declared it destined to be “the La Tache of California.” Considerable effort was needed to transform the property in the remote Sonoma Coast wilderness into a world-class vineyard. Viticulturist David Abreu divided the site into 30 one-acre blocks, each dedicated to a single clone determined to be the best match for the block: 16 clones in all. The Wayfarer fruit was blended into Pahlmeyer’s Sonoma Coast wines beginning in 2005. I visited the vineyard in 2004 with then Pahlmeyer winemaker Erin Green (see The PinotFile, Volume 3, Issue 24). The wines are vinified now by talented winemaker Bibiana González Rave who was trained in viticulture and winemaking in the vineyards of France. I have been impressed with her talent and drive since our first meeting at the World of Pinot Noir when I interviewed her for Grape Radio. The scheduled inaugural releases will be in the fall of 2014. My advice is to get on the mailing list now while you can at www.wayfarervineyard.com. 2012 Wayfarer Estate Sonoma Coast Pinot Noir 5-7% whole cluster. 2012 Wayfarer Golden Mean Sonoma Coast Pinot Noir 25% whole cluster. 2012 Wayfarer The Traveler Sonoma Coast Pinot Noir 32% whole cluster. A DRC suitcase selection. 2012 Alma Rosa Sta. Rita Hills Pinot Noir $35, screwcap. Very approachable, ideal dinner wine. 2011 Babcock Winery Appellation’s Edge Sta. Rita Hills Pinot Noir $60 (sold out). Sourced from Radian Vineyard Blocks 32 (Pommard) and 33 (Dijon 115). Grown at the extreme western edge of the Sta. Rita Hills AVA. 2011 Baxter Winery Valenti Vineyard Mendocino Ridge Pinot Noir 12.5% alc., $45. Fermented with 30% whole cluster using native yeast. Aged in all neutral French oak barrels for 20 months and then aged 12 months in bottle. 2012 Bruliam Wines Gap’s Crown Vineyard Sonoma Coast Pinot Noir Dijon clones 777 and 115. 100% de-stemmed. Aged 10 months in 40% new French oak barrels. 2012 Cebada Vineyard Estate Santa Barbara County Pinot Noir $42. Part of Forbidden Fruit Orchards, a boutique farm and winery located between Buellton and Lompoc, just west of the Sta. Rita Hills AVA. Clones 2A, 115, Calera and Pommard 4. Aged in about one-third new and two-thirds neutral French oak barrels. 2012 Charles Heintz Vineyards Heintz Vineyard Sonoma Coast Pinot Noir 200 cases, $48. 2013 Charles Heintz Vineyards Heintz Vineyard Sonoma Coast Rosé $19. 2011 Domaine de la Côte Sta. Rita Hills Pinot Noir 12.5% alc., 645 cases, $45. 50% whole cluster. 2011 Joseph Phelps Freestone Vineyards Estate Pinot Noir $55. 59% Pastorale Vineyard and 41% Quarter Moon Vineyard. 17% whole clusters. Aged 14 months in 40% new and 60% two-to-three-year-old French oak barrels. 2011 Kitá Wines Hilliard Bruce Vineyard Sta. 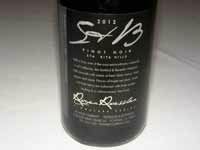 Rita Hills Pinot Noir 13.5% alc., $60. Wines produced by winemaker Tara Gomez and assistant winemaker Tymari LoRe. Aged in 40% new French oak barrels. 2012 Kitá Wines Hilliard Bruce Vineyard Sta. Rita Hills Pinot Noir Unreleased. 2012 Left Coast Cellars Cali’s Cuvée Willamette Valley Pinot Noir $24. A blend of grapes from the Left Coast vineyards, crafted from a wide variety of clonal and rootstock combinations. Dijon clones 115, 667 and 777. 2011 McEvoy Ranch “The Evening Standard” Marin County Pinot Noir 195 cases, $45. Known for olive oil, but now producing wine under the McEvoy Ranch label. The winemaker is Dr. Maurizio Castelli assisted by Blake Yarker. 2012 Paul Lato “Atticus” Sebastiano Sta. Rita Hills Pinot Noir $70. A blend of 115 and Swan selection. As usual, the Paul Lato booth was swamped with people so I gave a wave and tasted a bit of this wine out of magnum format. 2012 R² Wine Company Hein Vineyard Anderson Valley Pinot Noir $48. Limited production. 2011 R² Wine Company Black Pine California Pinot Noir $26. 80% Sonoma Coast fruit. 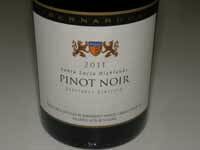 2012 RN Estate Solomon Hills Santa Maria Valley Pinot Noir 205 cases, $55. Clones 115, 667 and Pommard. Aged 10 months in 40% new French oak barrels. 2012 Seagrape Wine Company “Jump Up” Sta. 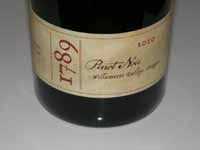 Rita Hills Pinot Noir 192 cases, $40. Produced by Dave Steinwachs and winemaker Karen Steinwachs, the winemaker for Buttonwood Farm Winery and a long time board member of World of Pinot Noir. A blend from Rancho la Viña Vineyard (777) and Rancho Santa Rosa Vineyard (667). 25% whole cluster from Rancho la Viña aged in 15% new French oak and 100% de-stemmed from Rancho Santa Rosa aged in once-used French oak. 2012 Seagrape Wine Company Rancho La Viña Sta. Rita Hills Pinot Noir 24 cases, $40. From a 1-acre “Seagrape block” planted to clone 777. 25% whole cluster. 2011 Sonoma Coast Vineyards Bodega Ridge Vineyard Sonoma Coast Pinot Noir 14.6% alc., 196 cases, $50. 2011 Wren Hop Vineyards “Wisdom & Chaos” Estate Russian River Valley Pinot Noir 375 cases, $62. Dijon clones 115 and 667. Raised in 100% new French oak barrels. Each of his wines are vinified in about 5 barrel lots. I have tasted a number of older vintages and can testify that they age extremely well. The wines were bottled in July of 2012 and represent both fall 2013 and spring 2014 releases. The winery is in a bare bones warehouse in Sonoma as part of the Eighth Street Wineries. Nothing fancy, just great wines. 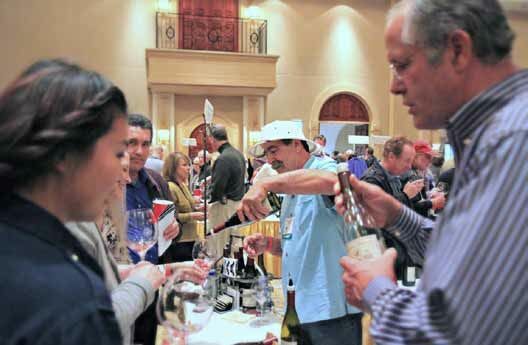 The winery is open several times a year during regional and local open house events, and Scott and Marta pour at many major Pinot Noir festivals including this recent World of Pinot Noir event in Santa Barbara. 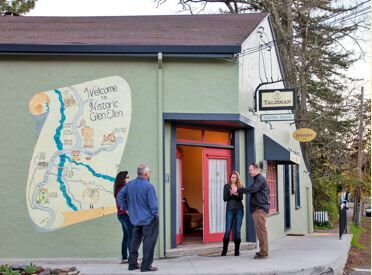 Tasting by appointment is available in a building that is over 110 years old in the heart of historic Glen Ellen. The tasting room is open Thursday through Sunday by appointment. 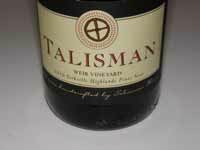 Visit www.talismanwine.com. I can’t tell you how impressed I was with every Pinot Noir I tasted in the 2010 lineup. They are all outstanding, so the scores simply reflect my personal taste and critical preferences. In any case, you can’t go wrong with any of the wines. 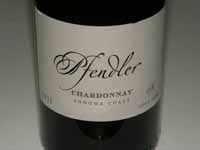 I have been following Pfendler Vineyards since it was founded in 2007 by Kimberly Pfendler. Her late spouse Peter was the first to plant vineyards in the Gap’s Crown region, and today she honors his legacy with continued dedication to producing premium Chardonnay and Pinot Noir from her estate vineyards in the Petaluma Gap region of the Sonoma Coast appellation. Pfendler Vineyards farms Pinot Noir and Chardonnay on four estate vineyards under the direction of viticulturist and winemaker Greg Björnstad. This unique region in the Petaluma Gap exhibits a combination of foggy mornings, sunny days and windy afternoons, allowing cool climate grapes to mature through an extended growing season. 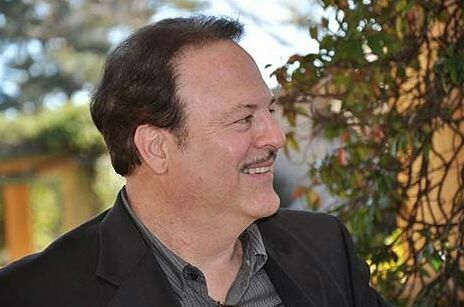 The 2012 vintage in the Sonoma Coast was described by Greg as a “relief” after two very challenging and low yielding vintages in 2010 and 2011. The harvested fruit in 2012 was plentiful in contrast, with remarkable consistency, quality and ideal balance and structure. The two 2012 wines reviewed here are the best from Pfendler Vineyards to date and Kimberly must have considerable solace knowing that she has fulfilled Peter’s legacy. Both wines were released in February 2014 and were poured for the first time at the recent World of Pinot Noir. Pfendler Vineyards wines are sold on the website at www.pfendlervineyards.com and through a mailing list. 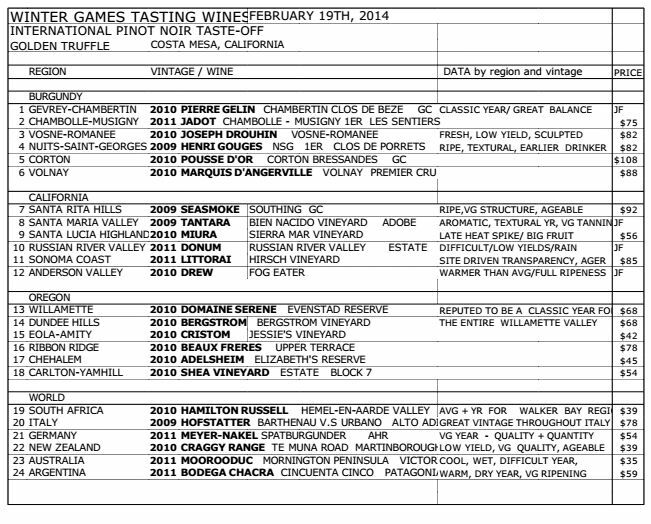 Winemaker Jeff Fink held an extensive blind tasting of Pinot Noirs from around the world on February 19, 2014. The lineup included 2009, 2010 and 2011 Pinot Noir from Burgundy, California, Oregon, South Africa, Italy, Germany, New Zealand, Australia and Argentina. The tasting was conducted in six flights of four wines each with a seventh flight at the end consisting of the four highest scoring wines judged to determine the consensus favorite wine of the evening. This final flight was followed by an unmasking of the identities of all the wines. The tasters consisted of about 30 Pinot Noir enthusiasts who were friends of Jeff (I didn’t know he had that many friends). 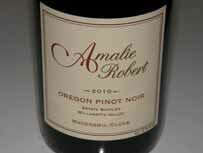 Oregon’s Pinot Noirs scored highest, as four out of the top six wines were Willamette Valley selections. Seasmoke was the grand champion for the second year in a row. Not just any Sea Smoke, but the same wine in both tastings: the 2009 Southing Sta. Rita Hills Pinot Noir. Hype meets reality! 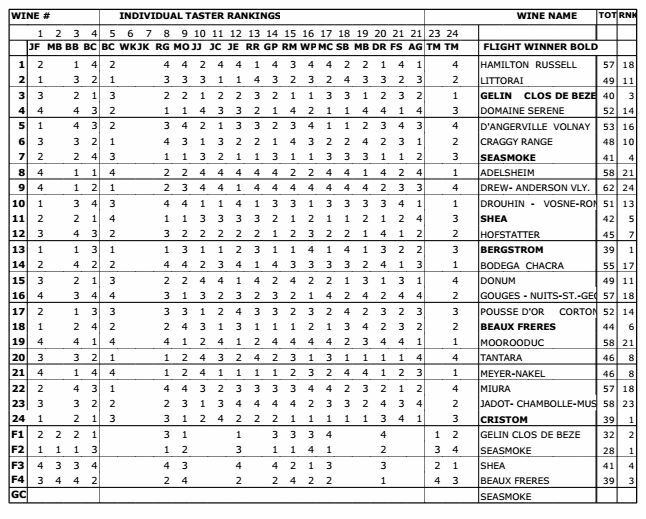 The wines I preferred in each flight were (see the chart below under “RG,” taster #8. 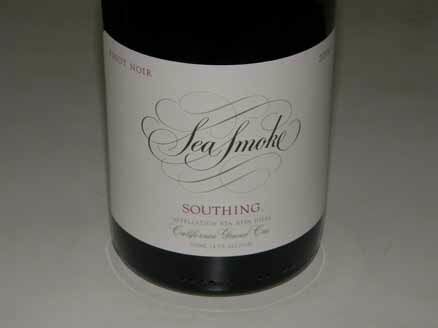 My overall favorite wine was the 2009 Sea Smoke Southing Sta. Rita Hills. 14.5% alc., pH 3.33, TA 0.67, $52. Exclusively Sea Smoke Estate Vineyard. The Balverne name was reintroduced by Windsor Oaks Vineyards & Winery in the 2010 vintage. In the 1970s, Balverne was a leading name in artisan wineries in Sonoma County. The inaugural Balverne Pinot Noir was vinified by the original winemaker for Windsor Oaks, Julie Lumgair. The current winemaker is Margaret Davenport, who has refined the style, adding elegance and nuance to Pinot Noir from this site. Balverne’s first winemaker, Doug Nalle, consults on the wines. Owners Bob and Renee Stein bought the Balverne property in 1992 and renamed it Windsor Oaks Vineyards. It is located just south of Healdsburg and spans both the Russian River Valley and Chalk Hill AVAs. 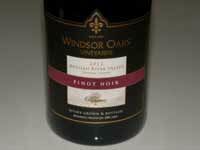 Wines have been offered under the Windsor Oaks label since 2005 and three Windsor Oaks wines are reviewed below. Sometimes a pleasant surprise shows up unannounced in my wine locker. 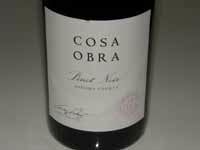 This was the case with Cosa Obra Pinot Noir, from a producer I was unfamiliar with. The name Cosa (“thing”) Obra (“a hand-crafted body of work”) refers to the winery’s thing, what they do, their hand-crafted body of work. Owner Gregory Hayes, with over two decades of experience in the wine industry, has chosen to produce small amounts of exceptional wines from multiple unique terroirs. The consulting winemaker is Kent Humphrey (Eric Kent Wines). The winery’s sincle Pinot Noir is sourced from the best blocks of vineyards in the Russian River Valley and Bennett Valley regions. 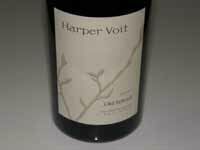 Les Voleurs is an urban San Francisco winery founded by Matthew Purdon and Keith Crowell. 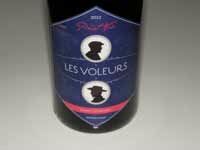 The name, “Les Voleurs,” is French for “The Thieves.” The winery originated as an underground wine club in San Francisco in 2008 called the Wine Thieves. The name was chosen because of the club’s liberal use of the “wine thief,” a glass siphon made for stealing wine out of the barrel for tastings. 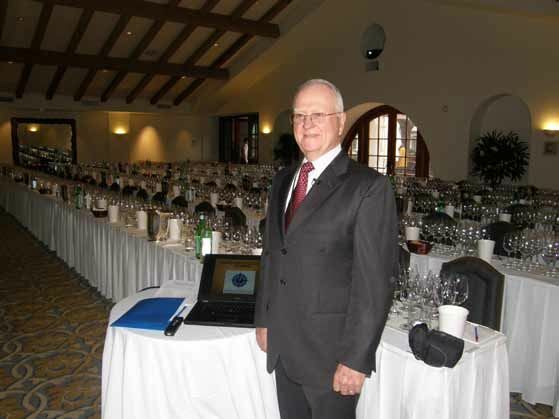 Purdon developed an interest in wine in college, undertook winemaking studies at the University of California at Davis, and started a winemaking club in San Francisco that evolved into Les Voleurs Wines. Crowell has a background in beer, wine and sake making. This was my first experience with Les Voleurs wines and I was impressed by the capable winemaking and high quality of the wines. This is a newer winery worth following. A member of a small group of Pinot Noir producers vinifying their wines in neutral oak barrels. Visit www.lesvoleurswines.com. 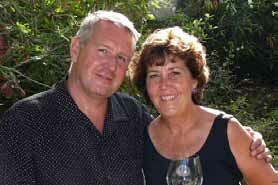 Bobby and Char Kiel own Rocking K Vineyard, located in Sonoma Carneros across the street from Sangiacomo Vineyard and just two miles from the historic Sonoma Town Plaza. My wife and I recently stayed in one of two cottages that are for rent on the property and thoroughly enjoyed our time there. I visited Bobby and Char last year and was enamored with their small production, single vineyard Rocking K Vineyard Pinot Noir. The reviews of the 2010, 2011 and 2012 vintages are at www.princeofpinot.com/winery/ 2222/. The location is ideal for exploring the town of Sonoma and its tasting rooms and restaurants, the wineries of Carneros and Sonoma Valley, and the Eighth Street Wineries of Sonoma. The one bedroom and two bedroom cottages have been completely updated and decorated, and have all the amenities including a kitchen. 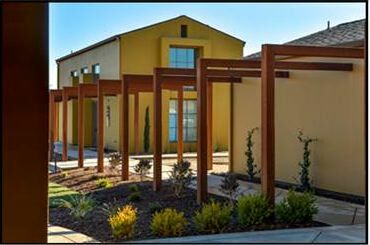 They have vineyard views and large outdoor patios. 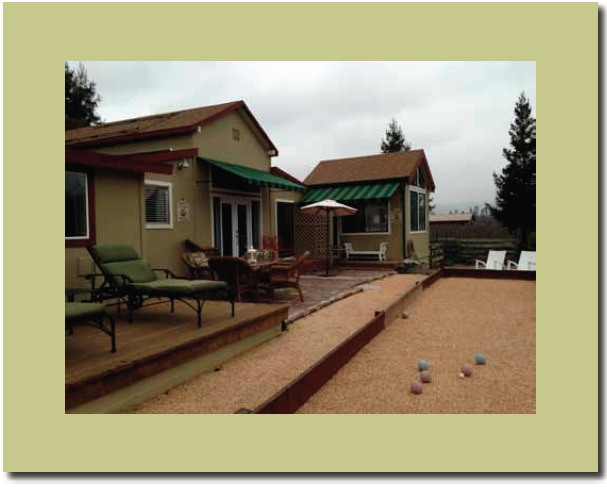 Call Char at 415-609-4299 or email her at char@rockingkvineyard.com for information and to reserve a cottage. Tell her you are a fan of the PinotFile, and she might give you a discount depending on the season and availability. 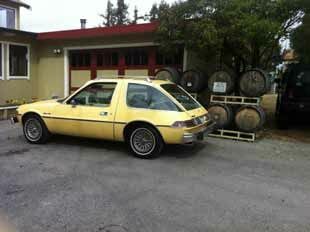 Ask her to show you her classic AMC Pacer which she tools around Sonoma in drawing plenty of looks.